The staggering demand for the Apple iPad here in the US is causing some headaches for those international customers who are looking to get a chance in purchasing the venerable tablet. We've already seen how Apple delayed the launch for the international iPad by a month, but now it looks like shipment dates have also been affected. Customers that pre-ordered it two days after the initial May 10th date saw their shipment date go from May 28th to June 7th. 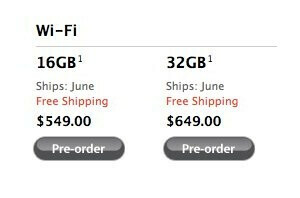 Now there will be some people waiting for an extended amount of time as the shipment date has changed again from “June 7” to simply just “June” – meaning that eager customers will have to wait at the most until the end of the month of June before seeing the iPad. With the May 28th go date nearing, it'll be interesting to see the outcome for the demand of the iPad and how Apple intends on catching up with supply.